A few years ago I was a guest speaker at a charity event and it changed my life. I had decided to share something very personal that day, one of my deepest darkest fears… that I grew up feeling like there was something fundamentally wrong with me. Little did I know that everyone in the room felt the same way. It was really eye-opening. Part of me felt sad that I’d taken so long to open up and part of me felt relieved that I wasn’t alone. And then it occurred to me, How many of us don’t reach our potential because we’re fearful–of failure, of feeling like a fraud, of being judged? Too many! I wrote Your Brilliant Un-Career to show you how to make the leap into entrepreneurship and introduce you to 21st century marketing principals, but more importantly, to show you that you are capable and unique, that your dreams deserve to be realised. For too long now women have been led to believe they have to choose between career and family, between a life and a career. That is no longer the case. 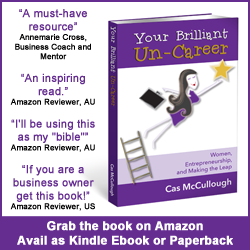 Your Brilliant Un-Career is your ultimate roadmap for making the leap into your own business, whether you’re a woman corporate escapee, wantrepreneur, or entrepreneur! Using this book as a platform, be empowered to discover your profitable purpose, and set your own unique path to spectacular success, on your terms! Cheers to your brilliant un-career! If I can do it, so can you! We just climbed a mountain! Corporate marketing and communication executive, freelancer, singer/songwriter, political activist, craftisan, birth doula, mother, Zumba instructor and social entrepreneur — In my 20+ year un-career, I have done it all. After a near death experience, in 2010 I founded my first startup and now juggle running a successful content marketing agency, a tech startup, and my online training programs from my Brisbane-based home office while solo parenting and home educating my three boys. I co-work, co-create, always challenge the status quo and encourage other women entrepreneurs to embrace their potential at every opportunity.I strongly believes that women everywhere are only just beginning to realise their capabilities in the startup space. My mission is to change the stats on women-owned business and inspire women business owners to lead the way in radically transforming the way we work, live and play. My main website is casmccullough.com, where I blog about content marketing. I’m a Twitterholic, so come and find me there! If you say gidday, I’ll tweet back!